Guanciale is magic. Imagine bacon, only better; porkier, tastier, richer. Guanciale is the cured jowl of the pig. It is cured in similar fashion to pancetta, which is unsmoked cured pork belly, but the location on the animal gives it a very different taste and texture. Since the cheeks/jowls of the pig see a lot of exercise the hunk of pork derived from them is tougher than the belly, and has much more intramuscular fat instead of layering as is seen on the belly. I used a very simple formula to not hide the quality of this pork which i got from Niman Ranch. Unfortunately this piece of meat is very difficult to find, even in ethnic butchers. You can sub a piece of pork belly and get good results as well. The cure mixture is rubbed onto the jowels, making sure to get into the "nooks and crannies". The jowls are then put into a ziplock bag, and they'll be turned every few days. Once cured, they'll be hung to dry for anywhere between 1 and 6 months. You make it sound so easy, and I know it is not. Thanks Rowdy...this is one of the easiest cured meats...this and pancetta can be dried in a regular refrigerator. I'll explain in a few days once i hang mine. How long are you going to cure it? I'll probably cure it for about 7-10 days, then dry it for at least 30. How do you get the jowls from Niman ranch? I've never seen them offered on the web site. Special order? Any recollection of what the minimum quantity was? JimK, i don't know if htey sell them anymore. I got them about 2 years ago, and they've been vac packed in my freezer since. There was no minimum order back then. Jason-approved jowls at www.cawcawcreek.com ! Awesome, thanks Emile. Good to know you have them! I DO love cawcaw creek pork..it's been the best i've ever eaten. My guanciale has been hanging now for a week, and I have a few questions. First, I've read your timings and also those of Polcyn & Ruhlman in Charcuterie. 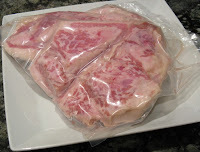 Yours seems to be around 3+ weeks in cure in the fridge, and then hanging from 1-6 months in your curing chamber. P & R suggest a small week curing in cure in the fridge and then 1-3 weeks of hanging. Can you talk about the difference? My curing environment (chamber is too fancy a word for my setup) has a temperature that varies from 40-55, and a humidity which varies from 28 to 48 and averages around 45 when I keep up on draping a wet towel alongside my environment. Should I be going by feel more than anything in this case? Mosaica, my fridge cures are about 2 weeks for all but the thickest of pieces of meat. More time won't hurt though. As far as the drying phase..more time will concentrate the flavors more. You can do it for less time, but it won't be as dry and as tasty...it really depends on what you prefer and also on your environment. Feel is really the best way to measure, but a month or 2 in the curing chamber will get you a tasty product. One of these days I'll have a *real* curing chamber. I've already printed out your excellent guide on making one, but I reckon it'll be a while before I get it finished. I'm tackling 20 pork jowls this morning, and intend on using your recipe for some of them. Looking forward to seeing how it goes. hi jason and other knowledgeable folk. i recently cured my first guanciale. having never bought any before, i dunno how it should taste, but its pretty delicious. can find any recipes - so does anyone have any advice. i was thinking of cold smoking after the curing process and pre hanging to dry. anyone have any experience or tips on this? one other thing - do you remove the skin from the jowl before curing? or leave the skin on? Adam: i leave the skin on until i cook with it. As far as smoking, yes, cold smoke after cure, before drying. Hard to say how much smoke since it depends on your setup, but probably 8-12 hours should be plenty. i agree about your post about leaving the herbs on or i may even cure it a little longer and add extra thyme. i have read some where that some italian guanciale - after rinsing after the curing, that they rub in dried pereronicino and pepper, then hang. ultimately smoke and herbs and other flavors are personal choice...experiment and find out what you like best. I like mine pretty simple. unless i'm mistaken, i don't think you posted how you would dry that in a regular fridge like you said you would. i'd be very interested in knowing how you'd do that as i'm still months away from having convinced my wife to let me use some of the storage space for my future curing chamber. 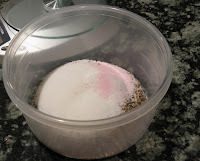 note on the salt: I did my reading and it seems the only difference between kosher and regular salt is the anti clumping agents and other additives... and of course in grain size.. so I figured coarse regular salt would do... am I right? or wrong? Were you equilibrium curing? If so, after a week it was probably pretty close to equilibrium if the piece wasn't very big, so you could proceed to drying. AT 3.5% salt it will be salty, but this isn't something you eat like a steak, it's like bacon, it's used for seasoning dishes.